The point seems awkward. After all, unemployment is a societal and an economic issue, how could corporate management be responsible in any way for any increase in the level of unemployment? Corporations do employ people. If the economy improves, they are the means whereby a reduction in unemployment can be achieved. Let me argue here that corporate management does have a responsibility not only for the current increase in unemployment but also, in particular, for long-term unemployment and that this will be a major part of corporations’ perceived social responsibility over the next decade. However, that does not mean that I am suggesting that corporate management is the main culprit for the current rise in long-term unemployment. There are plenty of other reasons that are discussed in as many forums, but I would argue that one important element is missing in these analyses: the very responsibility of corporations that arises from some of their management practices. Talent scarcity or talent mismatch? A paradox at a time of high unemployment. We know that our OECD countries will soon need to rely on more immigration to compensate for the decline of our active population; yet, at the same time, we are unable to mobilize 10% of our current active population and give them work. We will not be able to develop any socially acceptable immigration policy as long as we have not solved this unemployment problem, because no one will be able politically to defend an immigration policy developed in these circumstances. Even the defence of a “selected” immigration is politically hard to accept. How can we claim to have a lasting shortage of workers (which we do indeed! as all employer surveys and economic predictions show), while at the same time we have such a high level of unemployment? Most of the explanation lies in the fact that we currently have both a mismatch and a scarcity. There are at the moment some 13 million unemployed in the US and some 3 million job openings, largely requiring specific skills and training, that can’t be filled. Similar figures can be found all over Europe. But then, where is this mismatch coming from? We tend collectively to accuse the education system for not providing the ready-to-work employees corporations need. But is it really true? For sure, there are visible discrepancies between the needs of the “market” and the supply from the education system, but this has always been the case. However, in the past, corporations took it as an accepted way of operation that they should train newcomers and include them in the labor force. Has the situation really changed or have employment practices changed toward a reluctance to hire non-ready individuals? Furthermore, many of the unemployed are not young individuals straight out of the education system, but mature employees who find themselves in a no man’s land of employment because their old skills do not fit the new requirements. They have to become skill migrants (but is the social system of continuous education appropriate? ), industry migrants (but the skills requirements in services for example, for a migrant from manufacturing, are very different, demanding more soft skills like customer relationships, language fluency, etc. ), or regional migrants (but the cost of relocating has recently risen). The possibility of intra-domestic job market migration has become more difficult for many individuals. Finally, and this is the core question, corporations are beginning to be penalized for some of the externalities they are producing, such as pollution (“the polluter pays” principle) or CO2 emissions (including a sophisticated carbon trading system in Europe, which is attempting to reward the good industries and penalize the bad ones). But are corporations being penalized if they release on the market human resources who do not have sufficient “employability” because they did not bother to make them re-employable before they released them? And conversely, are they being rewarded if they release, after having trained them, labor-ready employees (this is particularly crucial for small and medium trade-skills related companies)? I am already hearing the counter-argument: “Corporations pay social security taxes for ensuring that workers get unemployment benefits when they are released. This is the way the market works. Once these payments have been made, corporations are exempted from the cost of any subsequent responsibility”. OK, but is this still true when so many people are switching to a long-term unemployment situation, where unemployment benefits stop flowing towards them? Corporations play the management game by the rules. They are not to blame for that; on the contrary, these rules have helped our societies to become richer and to grow permanently for the past forty years. But for exactly the same reasons as we are beginning to question the externalities of management on the usage of natural resources like water or energy, we should be beginning to question the externalities of these management rules on the labor market. A few “good” management practices (i.e. recognized by shareholders and by management books as good practices) actually have a significant and often negative impact on the labor market situation. Let’s look at a few. Transforming fixed costs into variable ones is a first rule. Using self-employed or temporary workers transforms fixed costs into variable costs (or, depending on who your master in management jargon is, transforms a high Net Present Value asset into a lower and controllable spend; or transforms a bench model into an “on demand” model). Overall, this is considered as good management practice in management books. And it is particularly true at a time when many payroll-related expenses, like health care in the US, are increasing very fast. But it pushes all the quantitative adjustment into the labor market, leading logically to higher structural unemployment, with a particular cyclical emphasis in time of crisis or of fast productivity gains, when the labour market is more than ever a buffer. Externalize costs whenever possible. Offshoring and outsourcing have been part of our industry landscape for more than two decades. They have already largely been accused of pushing “national” jobs abroad. But it was a “good” management practice. The current digitalization of many activities (from call centers, to data entry, to IT tasks, and even to medical tasks like imaging interpretation) leads to further offshoring or virtualization of work, thus creating global price arbitrage possibilities that may, in a lasting way, exclude some OECD country workers from taking those jobs, because they are not paid enough in the OECD owing to labor competition in the global/virtual market. Price arbitrage will eventually play out, but the transition period will be long and painful and many jobs will, for a long time, simply not be well enough paid for a worker to make a living in high-cost OECD countries. Reduce ramp-up costs is another rule. Applied to human capital, this means that corporations are led into recruiting more “ready-to-work” employees rather than training new (and often young) entrants. They expect the market to provide these ready-to-work resources. Corporations are no longer ready to pay for the transformation cost of raw material (be they young recruits or older ones) into work-ready material. The image of a Gen Y as unstable and not loyal could contribute to this reluctance toward investing in new talents. All parties, corporations and education systems are calling for greater effort and collaboration in solving this issue (a number of discussions at the last World Economic Forum dealt with it), but real efforts in the field are only anecdotal. If the hypothesis holds true (“there is a disconnect between the product of the education system and market demand”) and nothing is done to reconnect, the increase in talent mismatch is an obvious lasting consequence. This reluctance to hire less-than-ready resources is valid not only for the low skills but also for the college graduates for whom there currently seems to be (and this is certainly exacerbated by the crisis) a no man’s land to cross between college and a real corporate position. Students are tending to cross this no man’s land with further study, small jobs, unpaid jobs, and internships. It makes them unhappy, insecure and frustrated (and potentially less loyal). This phenomenon is obvious in many European countries, with the possible exception of Germany, where this no-man’s-land transition is being handled via a structured internship system. Increase productivity. This rule is very peculiar, since no-one is opposed to productivity gains, which, at an economic level, have proven how well they allow for growth, overall improved economics, etc. The reasoning is simple and has been proven over and over again: productivity gains free up resources that can be employed somewhere else to produce more goods and services. But productivity gains may – temporarily or structurally – not be translated into economic growth. 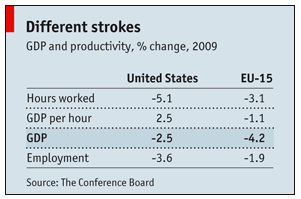 A good example of a temporary difference is probably the current (since 2008) contrast between the US and Europe, where Europe has not gained as much productivity as the US but has suffered less from increased unemployment. It seems that European companies have traded off some productivity gains for maintaining their employment level, while US companies have preferred to prioritize productivity gains. This trade-off is, incidentally, not the result of an intended management decision but, rather, of more rigid labor laws; I would not begin to claim that European companies are more inclined to protect jobs than their American counterparts. But behind this temporary issue there might also be a structural issue, if the freed resources cannot be re-employed easily and become a lasting social burden via the cost of supporting long-term unemployment. The current skills mismatch in all OECD markets shows that this is where we are: many individuals are simply not re-employable. If this structural element is too significant, it will be very hard not only to increase immigration when we need it, but also merely to pay for this high unemployment level. While our economies may currently still be able to afford to pay for 10% of the population being unemployed, they face a constant increase in other expenses, from debt to health to energy to education and training, etc., and it is hard to believe that such a high level of unemployment (and particularly its variance, which is reaching 40% in certain segments of the population) is sustainable economically and socially. Within this productivity debate there is another one hiding: the constant value-addition to current tasks and the replacement of some human tasks by technologies. Most jobs today have a higher and higher requirement in technological skills (for instance, a truck driver is no longer merely driving a truck but is also an important link in the electronic management of the supply chain). Many jobs can also be replaced by technologies, such as supermarket cashiers, who will progressively be replaced by RFID readers. Many companies, again according to a good management practice, are replacing work with capital investment (especially when capital is still relatively cheap, as is currently the case). They will release low-skilled workers who are unable to adjust to the new requirements or made redundant because of the new technologies. If these workers cannot find another job, we face a situation where good corporate management of productivity creates a social issue of unemployment. Where does that lead us to? There is no silver-bullet solution to this issue because, at the very least, it seems impossible to ask managers to manage differently. The competitive market is here; shareholders have expectations. No company can change the rules and suddenly play a social role by hiring more non-ready workers, by training people better in order to ensure their later employability, by keeping them longer than required, etc. Let’s not fool ourselves. But we face a series of situations of real social unfairness: to those workers who are excluded from the labor market; to the taxpayer, whose money is used to help, indirectly, increase corporate profits (because in the end taxpayer money pays for the long-term unemployed); to companies, who actually release re-employable workers on the market (versus those who don’t) and are not rewarded for it. Corporations agree that there is here a shared responsibility with governments. 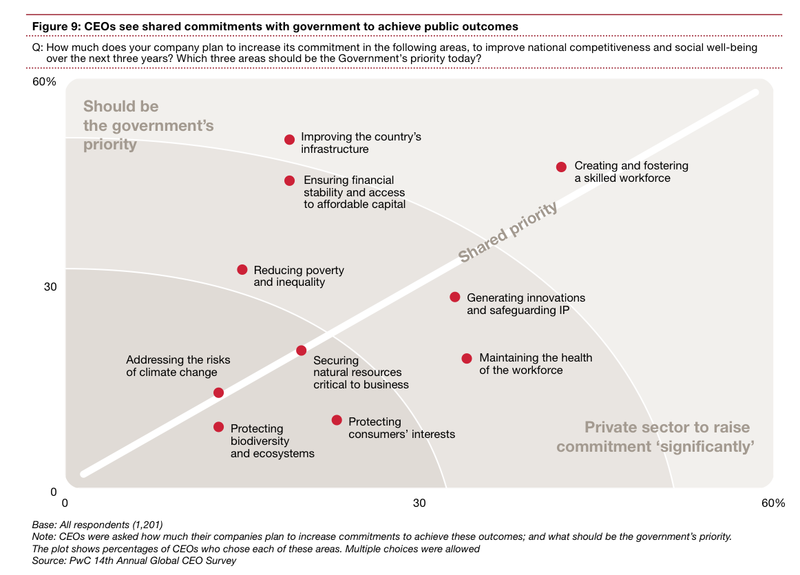 This was mentioned at length at the most recent World Economic Forum and figured as a high priority in PWC’s 2010 CEO survey, as illustrated in the chart below. But how this might translate into reality is still a question as elusive as the efforts all recognize should be made to save the environment. In times of economic or financial crisis, environmental and social issues suddenly lose their operational priority dimension. By OECD (Organization for Economic Co-operation and Development, OECD.org) I imply here rich nations in general.